The TC1300 combines a Low Dropout Regulator and a Microprocessor Reset Monitor in a space-saving 8-Pin MSOP package. Total supply current is 80 µA (typical), 20 to 60 times lower than in bipolar regulators. The TC1300 has an extremely precise output with a typical accuracy of ±0.5%. Other key features include ultra low noise operation, very low dropout voltage and internal feed-forward compensation for fast response to stepchanges in load. The TC1300 incorporates both over-temperature and over-current protection. When the shutdown control (SHDN) is low, the regulator output voltage falls to zero, RESET output remains valid and supply current is reduced to 30 µA (typical). 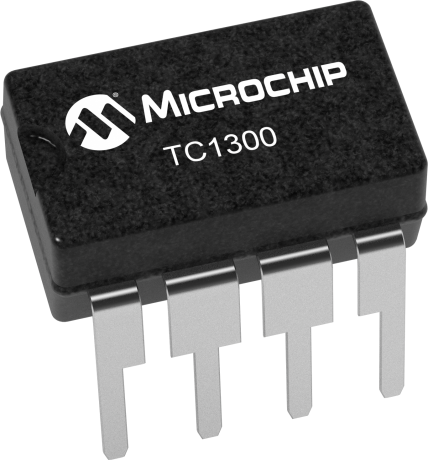 The TC1300 is stable with an output capacitor of only 1 µF and has a maximum output current of 300 mA. An active low RESET is asserted when the detected voltage (VDET) falls below the reset voltage threshold. The RESET output remains low for 300 msec (typical) after VDET rises above reset threshold. The TC1300 also has a fast wake up response time (10 µsec typically) when released from shutdown.